Health workers in November 2015 with Mibemba Soumah, infected by Ebola, at a treatment center in Conakry, Guinea. Credit Samuel Aranda for The New York Times. In a scientific triumph that will change the way the world fights a terrifying killer, an experimental Ebola vaccine tested on humans in the waning days of the West African epidemic has been shown to provide 100 percent protection against the lethal disease. The vaccine has not yet been approved by any regulatory authority, but it is considered so effective that an emergency stockpile of 300,000 doses has already been created for use should an outbreak flare up again. Since Ebola was discovered in the former Zaire in 1976, there have been many efforts to create a vaccine. All began with a sense of urgency but then petered out for lack of money. Although only about 1,600 people died of Ebola over those years, the grotesque nature their deaths — copious hemorrhaging from every orifice — has lent the disease a frightening reputation. Ultimately, only the huge, explosive 2014 outbreak that took 11,000 lives in Africa and spread overseas, reaching a handful of people in Europe and the United States, provided the political and economic drive to make an effective vaccine. The test results of the trial in Guinea were released Thursday in The Lancet. The vaccine was not ready in time to stop the outbreak, which probably began in a hollow, bat-filled tree in Guinea and swept Liberia and Sierra Leone before being defeated. But the prospect of a vaccine stockpile now has brought optimism among public health experts. The vaccine opens up new, faster, more efficient ways to encircle and strangle the virus. 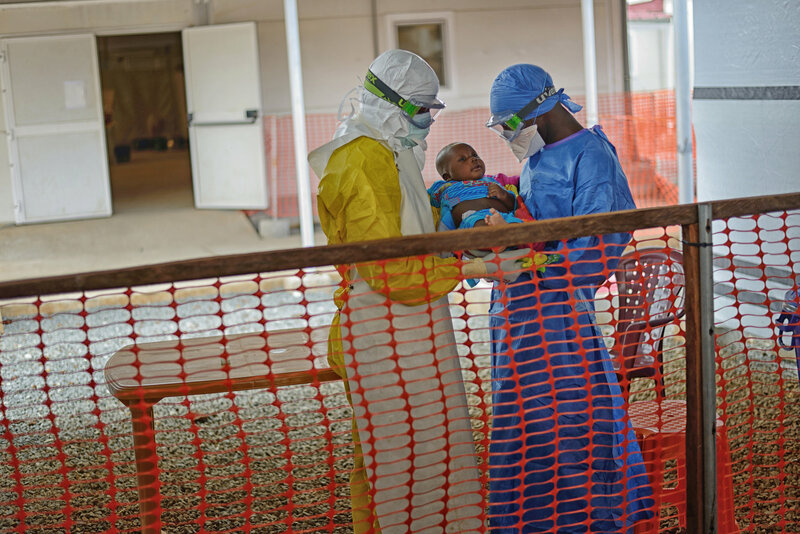 The many small Ebola outbreaks that occurred between 1976 and 2014 were all stopped in remote villages by laborious methods: medical teams flew in, isolated the sick, and donned protective gear to treat them and bury the dead. But that tactic failed in 2014 when the virus reached crowded capital cities, where it spread like wildfire and dead bodies piled up in the streets. The new vaccine has some flaws, experts said. It appears to work only against one of the two most common strains of the Ebola virus, and it may not give long-lasting protection. Some of those who get it report side effects like joint pain and headaches. The Lancet study was done in 11,841 residents of Guinea last year. Among the 5,837 people who got the vaccine, none came down with Ebola 10 or more days later. 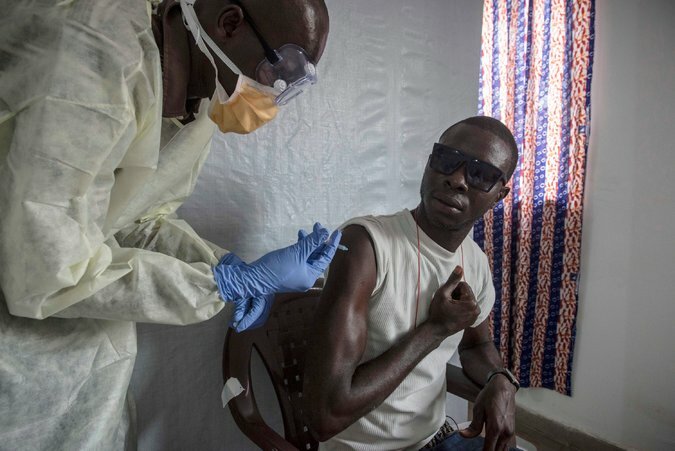 There were 23 Ebola cases among the thousands of others not immediately vaccinated. The Ebola trial was led by the World Health Organization, the Guinean Health Ministry, Norway’s Institute of Public Health and other institutions. The vaccine, known as rVSV-ZEBOV, was developed over a decade ago by the Public Health Agency of Canada and the United States Army and is now licensed to Merck. Its genetic “spine” is that of a vesicular stomatitis virus, which sickens cattle but usually does not infect humans. Spliced into the spine is the gene coding for an Ebola virus surface protein that prompts the immune system to make antibodies. Tests in monkeys showed that one shot protected all of them when it was given at least a week before they were given a high dose of Ebola. The shot even protected a few monkeys who received it a day after being infected with Ebola. The Ebola virus has five known subtypes, the most common of which are Ebola-Zaire, the one that caused the West African outbreak, and Ebola-Sudan. Ebola is also related to Marburg virus, which is similarly lethal. An ideal vaccine would protect against all Ebola strains and Marburg. However, Dr. Kieny said, it may not be possible to make a shot effective against several strains if it is t based on the VSV spine because VSV triggers a lot of side effects. Risks that are acceptable in the midst of a deadly epidemic are not acceptable in a preventive vaccine given to healthy children and adults, several experts noted. The new vaccine is “a step in the right direction but not the ultimate solution,” said Dr. Gary J. Nabel, chief scientific officer for global health research at the Sanofi pharmaceutical company, who designed a different Ebola vaccine in the 1990s when he worked at the National Institutes of Health. A randomized clinical trial involving tens of thousands of subjects is the preferred way to test any vaccine, he noted. But by the time testing could start in mid-2015 in West Africa, isolation and treatment of the sick in tent hospitals had made Ebola cases so rare that researchers had to switch to ring vaccination around the few they could find. A likely candidate for a routine Ebola vaccine is one now being developed by GSK, Dr. Nabel said. It uses two shots: the first has the Ebola surface protein attached to a chimpanzee adenovirus that can infect humans without harming them; the second uses a weakened pox virus similar to that used in smallpox vaccine. Dr. Seth F. Berkley, chief executive of Gavi, the Vaccine Alliance, said his organization’s board voted in late 2014 to spend up to $390 million for 12 million doses of an Ebola vaccine. At the time, several companies had candidates but none had been fully tested in humans. “That was at a time when the epidemic was raging and we did not know if it could be controlled without a vaccine,” he said. By early last year, when preliminary results suggested the Merck vaccine worked well, Gavi gave the company $5 million to make 300,000 doses as an emergency supply to be used if Ebola-Zaire exploded again. It is not yet clear how big a stockpile will eventually be created. Merck is now required to seek approval of its vaccine from the World Health Organization, which itself requires licensing by a major regulatory agency like the United States Food and Drug Administration or the European Medicines Agency.